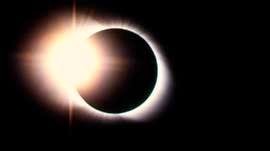 There is a Solar Eclipse coming up on March 20, 2015. We will be witnessing the biggest solar eclipse since 1999, when thousands of people flocked to Cornwall in the hope of witnessing this magical event. A solar eclipse occurs when the moons orbit lines up in-between the sun and the Earth. The moon therefore, blocks out the light of the sun temporarily. This casts a shadow on the Earth, creating a spectacular scene. These are all safe ways of viewing a solar eclipse, without causing damage to your eyes.